Whitman's annual civil rights education initiative, Whitman Teaches the Movement, widened its scope this year to include more grade levels, more volunteers and an expanded curriculum. 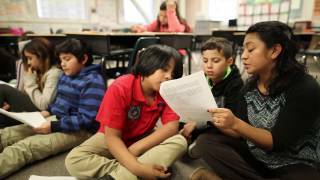 This video excerpts a discussion Whitman students led at Walla Walla's Green Park Elementary, which offers dual language instruction in English and Spanish, on the challenges of adapting to another culture and other immigration issues. Fourth-grade students, a new age group added this year, learned about Dominican-American author Julia Alvarez and interviewed each other about how to deal with bullying and discrimination. "It was really amazing to see," said theatre major Maddy Gold '19. "It's not every day that you have issues that people all rally behind, and this is one." A partnership involving Whitman, Walla Walla Public Schools and the Southern Poverty Law Center's Teaching Tolerance project, Whitman Teaches the Movement began in 2011 and reaches first through 12th graders. Topics have ranged from lunch counter sit-ins to women's rights to agricultural workers' strikes.